Have you ever dreamed about building a custom closet in your home? Even if this doesn’t describe you, we invite you to consider the possibilities that customized organization can bring to your household. Can’t keep track of where your household items disappear to? While everyone jokes about having a black hole in their closets, you don’t have to live that way. If you are interested in transforming the way you organize your life, we encourage you to contact an Oakland County custom closet designer.Below are some of the benefits of owning a custom closet. Becoming more organized is a common New Year’s resolution, but how many of us actually follow through on our good intentions? A custom-made closet remodel can help you stay organized year-round. For example, a walk-in closet in the bedroom can help you keep track of all your clothes and help make your mornings go faster. Have you ever stood in front of your closet not knowing what to wear? Part of this daily dilemma comes from not being able to see all the clothing items that are in our closets. For this reason, it isn’t uncommon for us to unbury a favorite shirt that fell to the back of the closet months later. 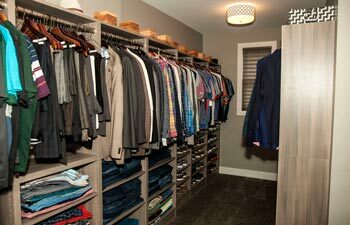 With a custom walk-in closet, you can easily store and find all your clothes and accessories. Custom closet designers can help you build the walk-in closet of your dreams. Probably one of the best benefits that come from a custom closet remodel is that they are designed specifically with your storage needs in mind. However, it is also for this reason that you will have to think carefully about what types of shelving and compartments will be most useful to you in the long term. For example, a series of strong hooks might be handy for the children’s backpacks, but could also be repurposed for scarves, purses, and coats when the kids move out. Long-term planning will help you get the most out of your new custom-built closet.